More consumers than ever are discovering great restaurants through social media. It therefore makes sense that a growing number of restaurants are integrating social media into their restaurant marketing strategy. According to Cornell University, approximately 75 percent of independent restaurateurs use social media to attract diners, and as much as 59 percent of chain restaurants and franchise brands do the same. Just getting started with your efforts on social media marketing for restaurants? Looking to optimize the results of your campaigns on Facebook, Instagram, Twitter, and other social channels? Here’s a list of tips and tricks, along with a few examples of restaurant marketers doing it right, to help you make the most out of social media and bring in more diners to your restaurant. One of the most effective ways to promote and market your restaurant on social media is by sharing lots of food photos. Let your food take centerstage! 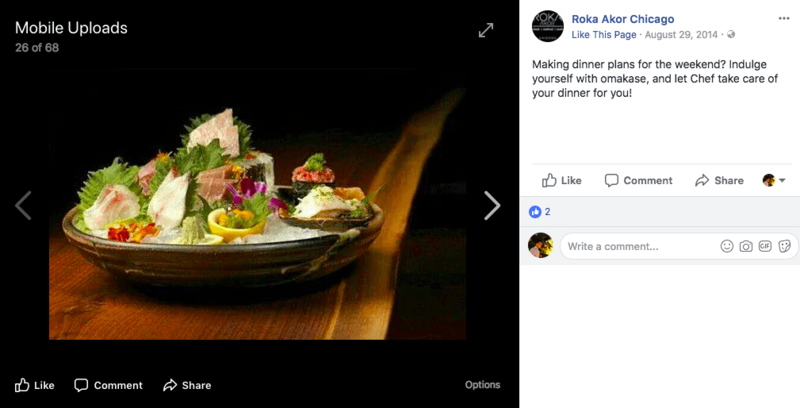 Regardless of the platform you’re using — Facebook, Instagram, Twitter, YouTube, Yelp, Google, whatever — be sure to develop a plan around regularly uploading high-quality, mouth-watering shots of your menu items. If social media marketing for bars and restaurants starts with photos, video content can help take you to the next level. A quick location video tour can give potential guests an idea of what it’s like to dine at your restaurant. Or shoot the items that are going to be part of your next set of promotions. Of course, you also have the option of posting live videos on Facebook, Twitter, and Instagram, which can be set up so that your most engaged followers are notified in real-time. Stream parties, fundraisers, and special occasion events or go behind the scenes in your kitchen. The best marketing in life is free. One of the most powerful ways to turn your happy customers into brand ambassadors is to share their reviews and experiences on social media. Not only do you get to publicly show appreciation for the people that matter most to your restaurant; you also create the kind of social proof essential to driving in new customers. Online review sites like Yelp, TripAdvisor, Facebook, and Google play a major role in shaping consumer behavior. By responding to your customers’ online reviews, addressing negative feedback, and showing appreciation for positive reviews, you can strengthen your restaurant’s online reputation on review sites and social media. Review response also shows potential customers how your management handles criticism online. Even if you’re not able to respond to 100 percent of your existing reviews, spend some time addressing critical customer feedback and attempting to turn around your relationship with customers who may not have had a positive experience. Most restaurants will have cooked up something special for traditional holidays like the Super Bowl or the Fourth of July. But if you’re looking at new ways to distinguish yourself on social media, plan some posts and content around food-related holidays, too — particularly if it’s relevant to your menu offering. It could be New England Clam Chowder Day or National Toasted Marshmallow Month. Whatever the occasion is, find a way to tie it into your menu. Don’t forget to add visuals and hashtags! Don’t let your menu sit idly on your website. Make sure you share it on social, too. Include a link to it in your tweets and Facebook posts, so that potential customers can take action, browse for more information, and engage. Sharing your menu on social media is a great addition to your restaurant marketing toolkit, especially if you offer delivery. Check out our guides to learn how to post your menu on Facebook, Yelp, and Google. If you’re a fan of food, you’ll have some measure of interest in how a certain dish is prepared or who the chef is behind a restaurant’s innovative menu. Social media is one of the best ways for restaurants to satisfy this interest. Give customers a sneak peek of the kitchen prep via YouTube or Facebook. Or have your chef or mixologist sit down in front of a camera for a Twitter or Instagram Live Q&A. By showcasing the kind of work that’s being done in your kitchen, as well as the people who perform such work, you allow customers to feel more connected to and engaged with your restaurant. By adding your restaurant location on your social media posts, you can improve your visibility on social media and help customers find you more easily. There are a lot of foodies on Instagram, each with their own community of fans and followers. Look up those that are located near your restaurant and try to build relationships with them. Invite them to dinner. Send them samples of menu items. Ask them to create sponsored posts or give a detailed review of the experience at your restaurant. You can even let them take over your Instagram account for a day, or turn them instantly into brand ambassadors by providing them with a custom discount link or code that they can share with their audience. Incorporate Instagram as part of your customer experience marketing strategy. The Cover image on your restaurant’s Facebook Page is prime real estate. So make it count. Take advantage by uploading a great food shot, or information on your specials or latest offers. You can even use a video as your Facebook Page Cover. Worried that your visuals might get cut off? According to Buffer, if you want to use a single image that works well on both desktop and mobile, the ideal size is 820 pixels wide and 462 pixels tall. ReviewTrackers’ Amplify embeds reviews onto your site, allowing potential diners to see the positive experiences other diners have had. If your restaurant is trying to encourage diners to try specific dishes or order more appetizers, you can make sure to post reviews that encourage those specific behaviors. Its quite a helpful Article for Restaurants Marketers to get their Food Business listed on these mentioned Listing and Reviews site. Here I wold like your users know about Save Now. Create a free Business Account, post your latest offers, and let your customers review your Business. I think that using social media is a great way for restaurants to attract new customers or maybe bring back repeat customers for a new dining experience. Pictures really show what you have to offer on your menu and what kind of atmosphere your restaurant provides. New menu items can be shown off on social media to bring in more customers.